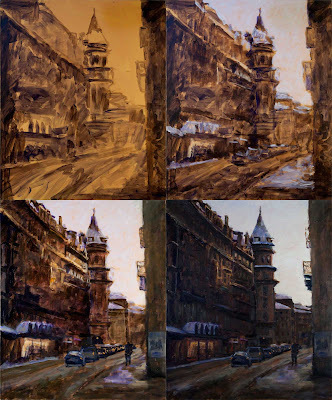 Its always interesting to look at different stages of a painting. Of course, each painter will have their own process, but this is fairly typical of mine. I always try to take photographs of the different steps, but sometimes I get sucked into the painting and forget. The first photograph has only fairly thin acrylic, it is my rough "drawing" stage. Then from the second photograph onwards I am in oils. Thanks for stopping by my blog. I enjoyed looking through your paintings. I think its interesting that I also do the drawing in acrylic and then tone the canvas and add some values in acrylic as well. Then I move on to oils. I like the fact that the color and drawing stays...no matter what I have to erase! Very nice light in this painting, and the architecture is wonderful. Than you for your comments. Yes Its very practical to lay the base with acrylic as you can start the serious stuff almost immediately after wards. That is AMAZING Peter!!! I had to click on the last painting (got them all) because it was so well done, I was wondering if it was your reference photo. Obviously your thorough drawing and block in led you to to a successful end!! Beautiful!